Print our template. 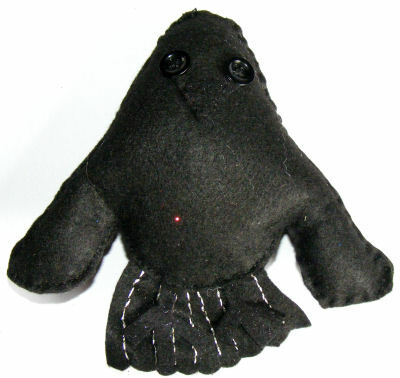 Cut out two bodies and a tail from black felt and the legs and beak from sparkly black felt. With silver thread backstitch lines on the tail to make it look feathered. 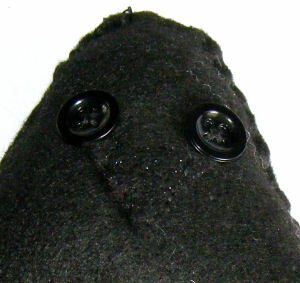 Sew the beak and the two buttons as eyes onto one of the bodies. Sandwich the two bodies together with the tail and feet in between them. 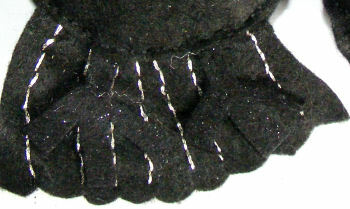 Stitch the bodies together so the feet and tail are held in place. Leave a gap to stuff the raven. Sew the raven closed. .